Here’s my video showing the unboxing and set up of my Garmin Vivoactive HR. This best-selling fitness tracker is a four-in-one device: an activity tracker; a sleep tracker; a smart watch with notifications; and a GPS device to track your bike rides,as well as your runs and hikes. Note that before setting up your Garmin Vivoactive HR GPS smart watch, you must download the free Garmin Connect app to your phone. You can also do the setup on a computer, but I find it easier on a phone. Also, the Garmin Connect phone interface has been vastly improved, and is now a pleasure to use, and great to look at. The Garmin Vivoactive HR is a chunky watch, and will not be mistaken for a fashion accessory. It is very clear what it is: a tracker for serious athletes. This is why some believe that fitness trackers such as the Fitbit Charge 2 are for weekend warriors, while the Garmin Vivoactive HR is for serious, dedicated athletes who do a lot of activities, and do them every day. As compared to the average Fitbit, the advantages that the Garmin Vivoactive HR offers include being totally waterproof, and also being useful for more sports, including indoor and outdoor cycling, indoor swimming, snow sports, hiking, running, cycling, and golf. 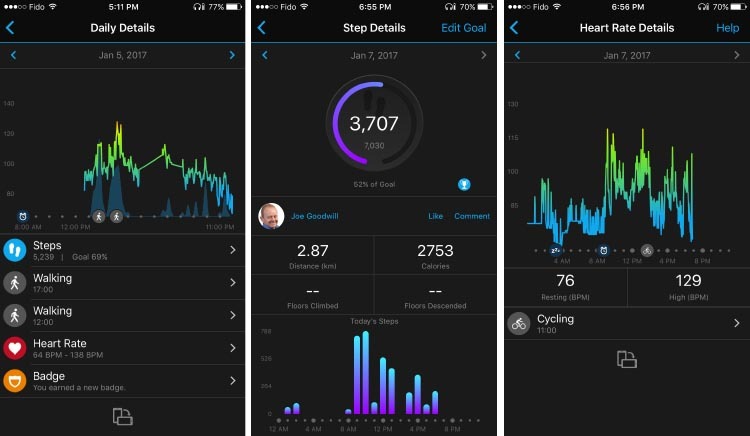 Which Sports can You Record with Garmin Vivoactive HR? The full list of preset sports on my Garmin Vivoactive HR is: Run, Bike, Pool Swim, Golf, Walk, Row, SUP, Ski/Board/ XC Ski, Run Indoor, Bike Indoor, Walk Indoor, Row Indoor. You can also add new sports that you set up and define. The Garmin Vivoactive HR has on board one of the most important must-haves for many serious athletes: built-in GPS. In fact, it has both GPS and Glonass, for super-fast signal pickup. GPS and GLONASS are different satellite systems – the GPS was developed by the USA, and the GLONASS is Russian. Glonass is the Russian GLObal NAVigation Satellite System. Speaking to both major satellite systems enables the Garmin Vivoactive HR to find satellites very quickly. 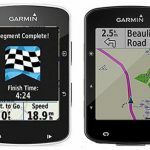 This model has been adopted for all of Garmin’s high end trackers, including the Garmin Edge 1000, 820 and 520 bike computers. 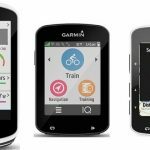 Read all about the best selling Garmin Edge 520 here! 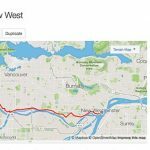 When you choose to record a bike ride, it will begin recording immediately if you are already locked into a GPS signal. However, if you are not, it will seek out a signal, and you must press the right hand button to start recording, once the signal is picked up. The good news is that this should occur within seconds. 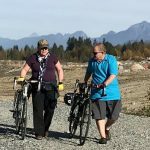 But don’t start riding until you see the timer start – it is very disappointing to do a great ride and then find out that the Garmin was waiting for you to hit Start the entire ride! The Garmin Vivoactive HR also has on board the most other very important must-have for many serious athletes: a built-in optical heart rate monitor. This tracks your heart rate 24/7, for a really comprehensive record of activity and calorie expenditure (with the one exception that it does not measure your heart rate while you are swimming). This built-in heart rate monitor means you don’t have to wear a chest strap. 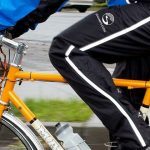 Many athletes find these uncomfortable, and it also makes it impossible to record a spontaneous bike ride. You have to plan to be wearing a chest strap – it doesn’t just happen accidentally! Of course, you can also access all your data and stats on a browser at https://connect.garmin.com/. Here too the interface has been hugely improved and modernized, making it good to look at and user friendly. One of the strongest attractions of the Garmin Vivoactive HR is the beautiful big, color display that is super easy to read, even in the sunshine. At any moment you can also engage the backlight by touching the screen. 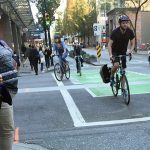 When cycling, it’s great to have an interface you can easily see. In general, you communicate with your Garmin Vivoactive HR with two buttons at the bottom, plus a responsive touchscreen. 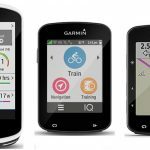 All of the athlete-friendly features make the Garmin Vivoactive HR very popular among cyclists. On the other hand, it’s a big watch, not a fashion statement, so it would not be a good choice for those who want a fashionable smart watch that also steps up to discretely track activities on the weekend. 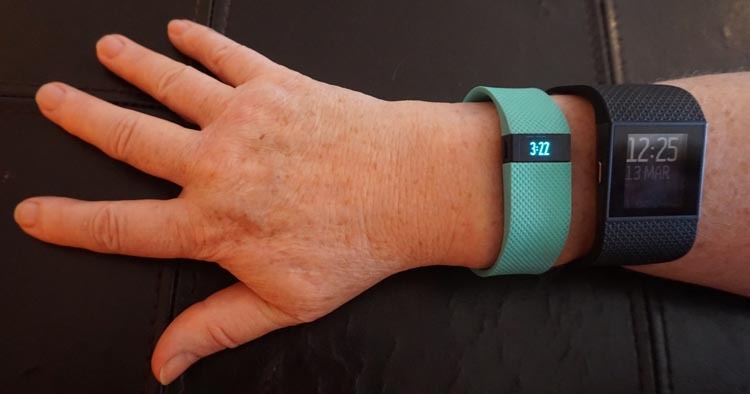 For that purpose, a fitness tracker such as the slim-line Fitbit Alta or the feature-rich Fitbit Charge 2 would be a better bet. 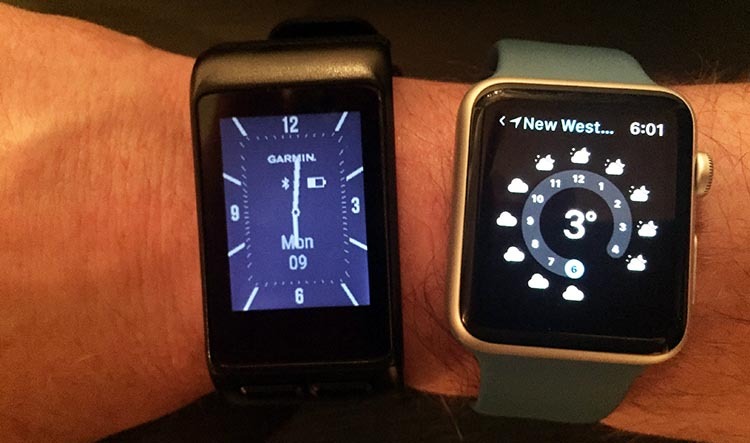 The photo below compares the size of the Garmin Vivoactive HR to the size of the larger size of the Apple watch (42 mm). The Apple watch looks bigger, but to me it actually feels smaller when wearing it, possibly because it is slimmer. The wrists shown here are small wrists. The Garmin Vivoactive HR also has the odd feature that it is more visible outdoors than indoors, so if you do most of your cycling on an indoor trainer, this is probably not the best fitness tracker for you. 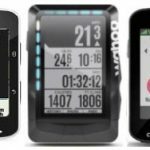 On the other hand, if you like to bike outdoors, you want to have all your devices on your wrist (and don’t want to have to wear a chest strap and carry a phone), you want to have all your data available on a snappy interface (Garmin Connect) and you are a really serious athlete (for example a triathlete) then you are likely to find what many other have found: that the Garmin Vivoactive HR is the best fitness tracker for you!